What to do there? In Putrajaya, you can find plenty of activities which are suitable for all age groups. It is also a family-friendly city to visit, so don’t worry about bringing your children along. Go on a tour of Putrajaya lake with a cruise for picture perfect sights of the futuristic Putrajaya bridge. Sign up for a sightseeing tour where you’ll be able to visit iconic structures such as the Prime Minister’s office, Pink Mosque and Taman Warisan Pertanian Agricultural Park. Better yet, craft your own tour and hike up Taman Saujana Hijau for a broader view of the city. 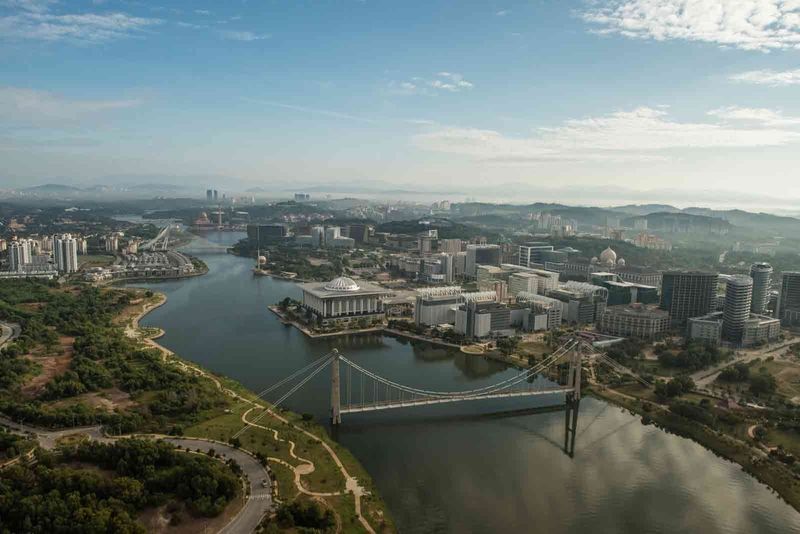 Putrajaya also offers an extensive range of facilities and variety of parks for outdoor sports such as skateboarding, mountain biking, windsurfing and flyboarding. What to see there? What makes Putrajaya distinctive than other cities in Kuala Lumpur is the late 20th century architecture that touches every aspect of the buildings, landmarks, gardens and parks. Although it is still an urban city, the environment here is different than Kuala Lumpur central district. It is definitely worth exploring as you can witness the other side of the Federal Territory which is more peaceful and calm. Visit the Palace of Justice for its majestic architecture inspired by Islamic and Moorish influences. Tick the Botanical Gardens off your list as well as you can also view the Moroccan Pavilion that is located within the gardens. For a grand view of the Putra Mosque, consider heading out with a boat onto the lake. Putrajaya has the world’s biggest roundabout with an approximate circumference of 3.5km. It is located in Persiaran Sultan Salahuddin Abdul Aziz Shah, which is nearby the Prime Minister’s office in Perdana Putra. There are a total of 8 famous bridges in Putrajaya with amazing architecture. Make plans for a free and easy road trip here to see them all. Precinct or housing area. Most popular bazaar among the locals is located in Precinct 3. If you are visiting the well-known Putra Mosque or Tuanku Mizan Zainal Abidin Mosque on a Friday, try to avoid the peak hours from 1pm - 2pm as the mosque will be packed with people for Friday prayers and traffic will be heavy around the area.